A grilled cheese sandwich is one of the most comforting foods that you can make. Grilled cheese is loved by people of all ages and can make for a great meal at any time of the day. While many people like to make grilled cheese in a broiler or in a frying pan, a much better option is to make it on your outdoor PGS Grill. This can be especially ideal when you are looking to entertain friends and family at a fun outdoor barbeque when you want to prepare something outside of the norm of hamburgers and hotdogs. A grilled cheese made on an outdoor grill will result in perfectly crispy bread and melted cheese, which cannot be replicated by the other cooking options. 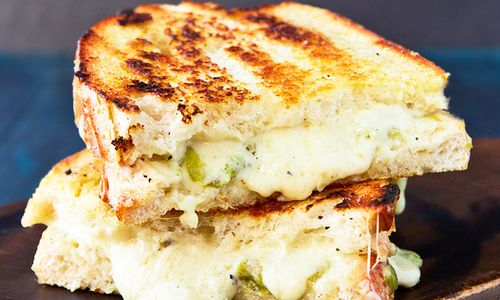 While you can make a standard grilled cheese at any time, when you are entertaining friends or family, giving them something fun and unique could be a great option. One unique and very flavorful option is the Crunchy Fajita Grilled Cheese. To make this on your PGS grill, you will need to follow the recipe and steps below. Making the Crunchy Fajita Grilled Cheese will require you to have the right ingredients. If you would like to add additional protein, some rotisserie-shredded chicken or sliced steak can be a great option. Prior to cooking a grilled cheese on your PGS Grill, you will need to make sure the gas grill is properly heated and prepared. Make sure that the grill is adequately cleaned, and then preheat it to a medium heat. While the grill is warming, you can start to prepare the sandwich. You will want to apply a generous amount of soft butter on one side of both pieces of bread. In the middle, you will want to put in at least two slices of Monterey Jack cheese while making sure the entire piece of bread is suitably covered by cheese. On top of the cheese, you will want to lay the peppers, onions, chips and add chicken. Be sure to know your guests’ tolerance for heat as the jalapenos can be quite spicy. Once the grill is ready and the sandwich is prepared, the actual grilling process will be very quick. The grill should be around 400 degrees in temperature. You will want to place the sandwich over direct heat and close the hood for about 3 minutes. After grilling the first side for a few minutes, you should flip the sandwich over and grill it for another 2 minutes on the other side. Once this is done, you should be left with a great-looking sandwich that has visibly melting cheese and perfect black grill marks on the bread. To enjoy the sandwich fully, you should eat it immediately. The Crunchy Fajita Grilled Cheese will give you an amazingly well-balanced experience that will combine the crispiness of the grilled bread and chips combined with the nicely melted cheese. Depending on how many peppers you added, there can be quite a bit of heat and spice as well. This sandwich can go great when paired with chicken tortilla soup, chips and salsa, and a cold beer.